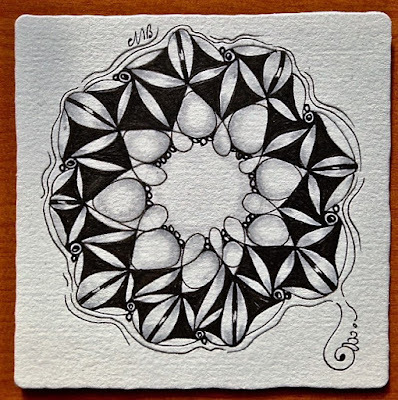 The featured tangle this week on our Facebook group 'Square One: Purely Zentangle' is echoism which is really hard to see on this tile but it's hidden in there. 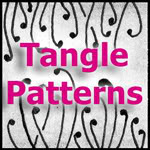 If you are not sure what it looks like click on Tanglepatterns. 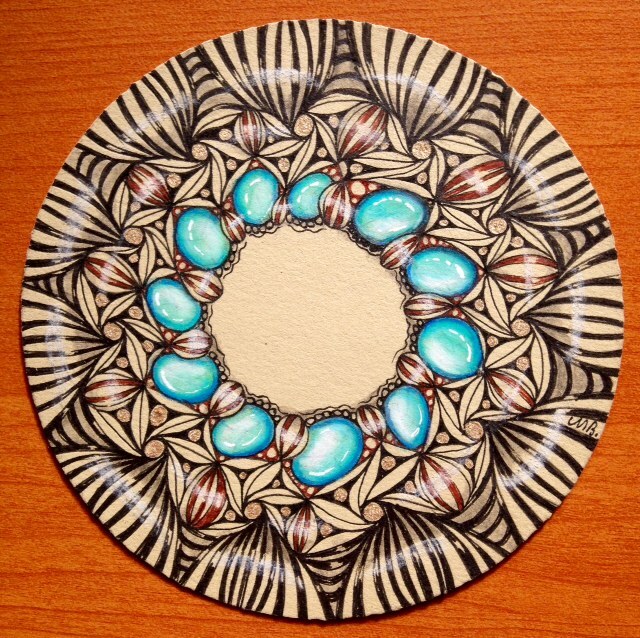 I decided to draw echoism around a circle so it worked really well for The Diva's challenge as well. It was funny how echoism disappeared by filling in the spaces and had to have another go with colour on a Zendala. Oh, my God I love this second tile, the first one too but the second that is just WOW: the composition, the tangles, the colors, so beautifull!!! Both Beautiful, love the shine in them! Awesome! Is it hours work Shelly? So beautiful. That's so clever to put "echoism" in a circle format. You have such great ideas!!! I'm going to try that myself. Thanks for sharing with us so many of your ideas. I so appreciate YOU! I love the echoism in a circle! Awesome tiles. Can't pick a favorite between them as I love both. Also a 'wow' from me; these two are gorgeous! 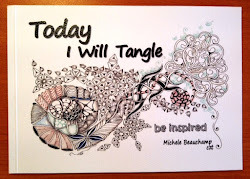 I did my tangle before checking out anyone else's this week and it's so exciting seeing other interpretations. These are both beautiful. Love both but the second is gorgeous! You're right. I would have never guessed the first one used echoism. Spectacular tiles! Both are amazing. I love your echoism ... I have been trying to get to know Echoism, but it just doesn't like me. 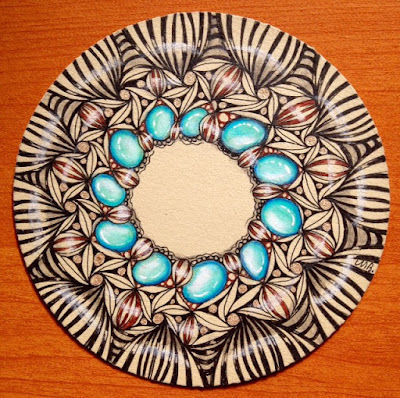 Your second piece is stunning and the color and shading is wonderful. Thank you for sharing! Both tiles are so beautiful! Thank's for sharing! Both are awesome, but that second one really sings!